View from our front window! Our warm Spring weather has brought so much color to my town! 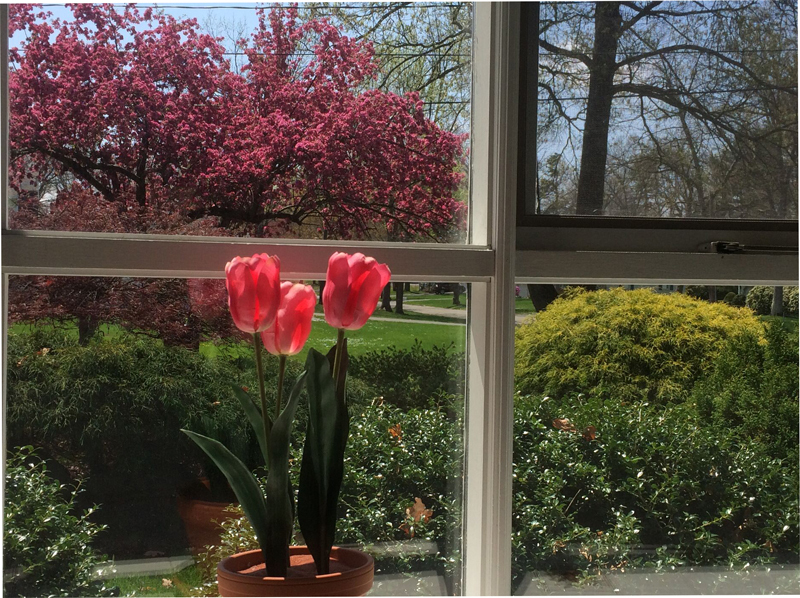 One cannot help but daydream while enjoying all of the flowering trees & bushes. The Forsythia bushes are now part bright yellow flowers & part green leaves. Flowering Crabapple trees add a beautiful pink color to our neighborhood. 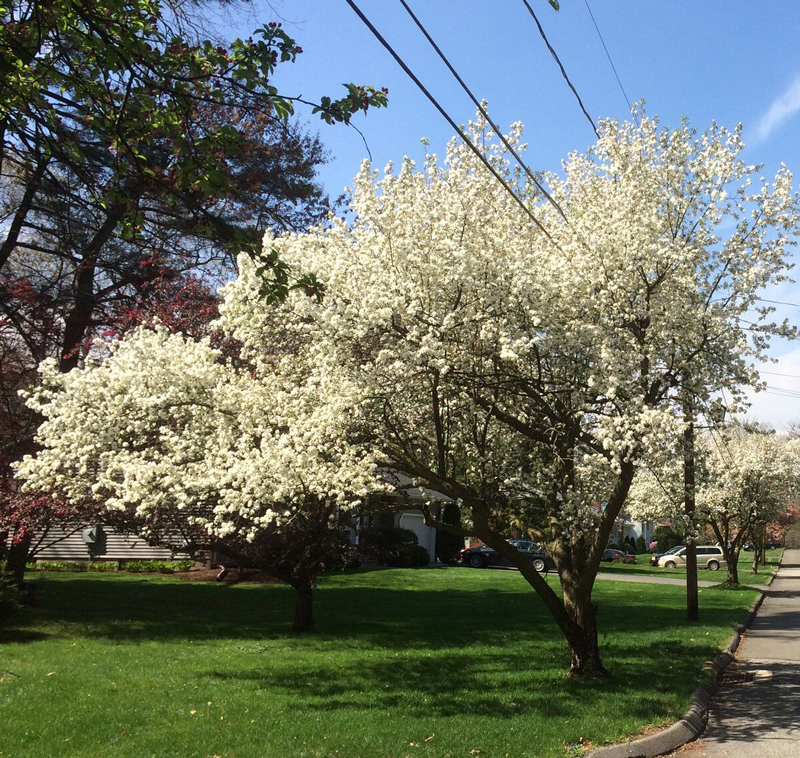 While taking the daily walk the white Crabapple trees add to the beauty, too! Ah, Spring in New England! What a beautiful time of year! 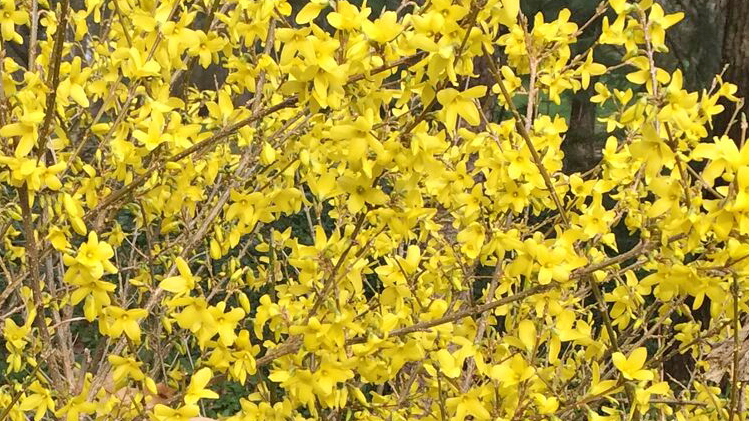 Whenever I glance out our kitchen window the bright yellow Forsythia blossoms get my attention! Three bushes are in our back perennial garden. It's so easy to admire these beautiful bushes all over my neighborhood, because many of us have them in our yards. 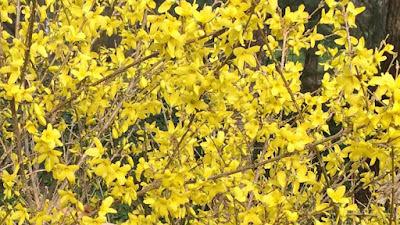 Last year, the Forsythia did not blossom, due to our warm, then freezing temps early in the year. They sure were missed! 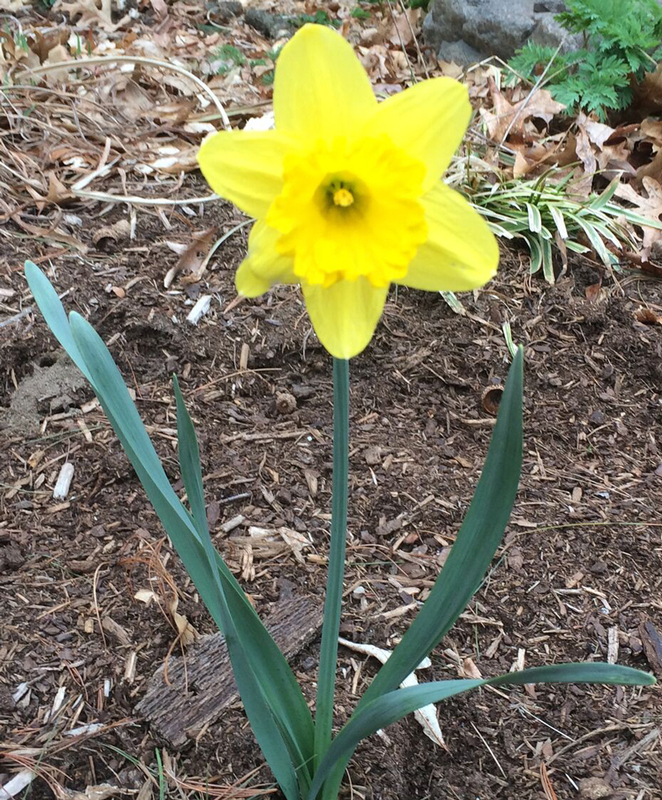 However, this year they are a welcoming Spring sight! 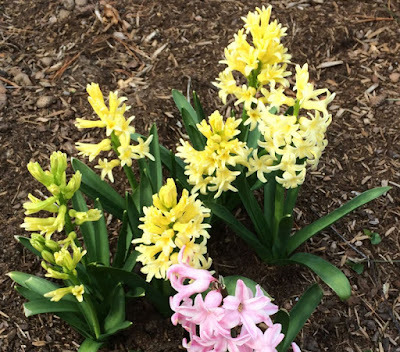 Pink & yellow Hyacinth flowers are opening on the stalks! It's a ritual that I enjoy seeing every year! Before I know it, it will be time to plant the saved Zinnia & Marigold seeds! Spring! Asparagus! Flatbread Pizza! Oh yes! What a great combination! A couple of months ago my DH & I were looking at the menu in a New Jersey hotel dining room- famished. I wanted to order something I'd never tasted. That's something I always enjoy doing. When I return home I like to prepare a new dish that's so tasty. There on the menu was "Flatbread Pizza". The description of the ingredients sounded so appetizing & I was so hungry! Oh, it was so good! Three weeks ago, a grocery store in my area started carrying packaged flatbread for pizza. O.K., that got my attention! Now, I've prepared Flatbread Pizza twice in the past 3 weeks. Forget Friday night pizza! These are great! They are so easy to prepare! The Directions are on the package. With the Flatbreads I use, they are placed on a baking sheet & baked for 2 minutes in a 375°F oven. 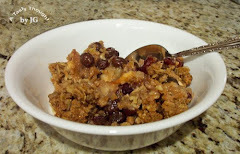 Add toppings & then return to the oven & bake again for 5 Minutes in a 375°F oven. It's Asparagus time, so roasting Asparagus that's coated with Olive Oil for baking & sauteing & also Parmesan cheese is a great veggie when making these. We like White Pizza, so a coating of Ricotta Cheese is a great base. 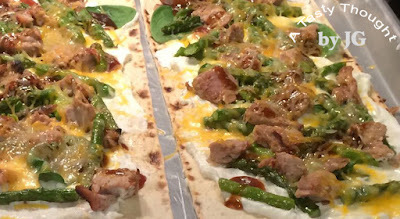 With the first Flatbreads, BBQed Pork Tenderloin chunks, Roasted Asparagus & fresh Spinach were placed on a coating of Ricotta Cheese. Top with shredded Mozzarella/ Cheddar! We enjoyed the taste of Veggie Dream Flatbreads the second time. 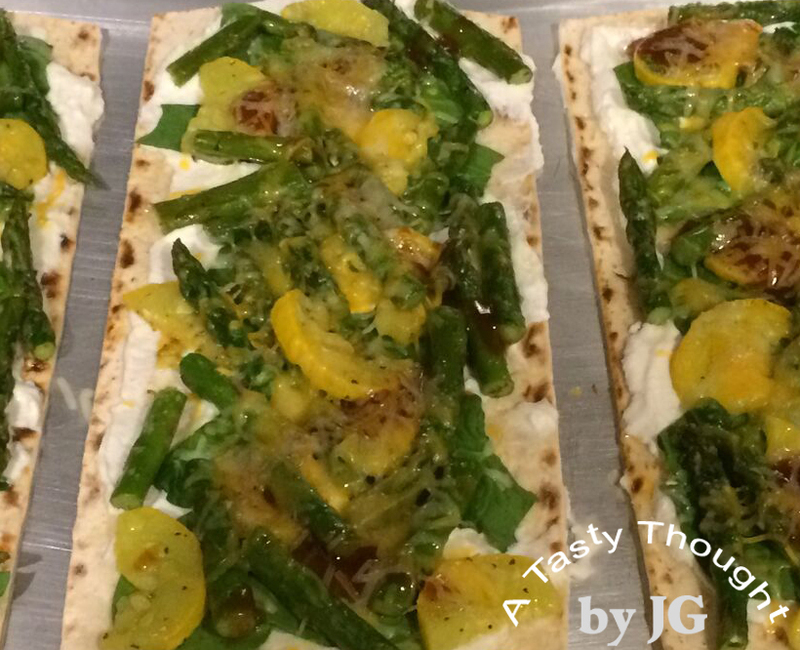 Roasted Asparagus & Roasted Summer Squash along with fresh Spinach were placed on the Ricotta. Before adding toppings, I spread a little Olive Oil for baking & sauteing on each baked Flatbread. Then, add & spread Ricotta Cheese on top. For both varieties make a drizzle of 1 teaspoon Water with 4 teaspoons of BBQ Sauce. Combine & then drizzle over the top of each Flatbread just before sprinkling on the shredded Cheddar/ Mozzarella Cheese. Bake. This gives it a great tang! Does your family enjoy these, too?